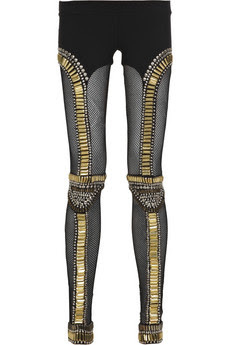 Sass & Bide call this "The Bullet paneled leggings" I call the fish-net stockings with some gold badazzle action on the front and back. Seriously, which idiot designed this and decided the price (£757.45) I don't see anyone paying THAT much money for such a stupid "legging". I sound like a crazy person, but I think I'd rather wear Lindsay Lohan's sad excuse for a legging line -6126.